Monticello’s 2009 Apple Tasting took place on Saturday, October 17. The tasting was held on Tufton Farm, one of the 5 satellite farms that Thomas Jefferson owned near his home, Monticello. Tufton Farm is home to the Thomas Jefferson Center for Historic Plants. The tasting was led by Tom Burford, an expert on old apple varieties and orchard design and author of several books on apple selection and cultivation. Peter Hatch, Director of Gardens and Grounds at Monticello and author of The Fruits and Fruit Trees of Monticello, was also on hand to help with the tasting and to engage in some good-natured sparring with Burford over apple history and lore. Over the course of 2+ hours, we tasted 21 different apple varieties. Each sampling was accompanied by background information on the apple’s origin and use. 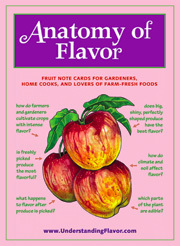 Tom Burford also added in lots of tips on apple cultivation and thoughts on how to find and savor the best apples. This tasting event was highly informative, and yet friendly and casual. The apples–many of which are not commercially grown and are, therefore, impossible to find in the marketplace–were hand labeled using Sharpie markers on stickers and the samples were passed on plastic plates that were also hand labeled. The selection of apples was broad and there were plenty of samples for everyone to get a good taste. The presenters, who are both extremely knowledgeable and very well-respected in their fields, were full of amusing stories, historical facts, and practical advice for aspiring orchardists. And, the $10 price tag was a steal for apple lovers who were eager to taste lots of different types of apples side by side. This year’s apples were Albemarle Pippin, Black Twig, Caville Blanc d’Hiver, Detroit Red, Esopus Spitzenburg, Father Abraham, Grimes Golden, Jonagold, Jonathan, Kinnard’s Choice, Pomme Gris, Ralls Genet, Roxbury Russet, Stayman, Turley Winesap, Virginia Beauty, Virginia Gold, Winesap, Yates, and York. We also tasted Fuji, which is a cross of Ralls and Red Delicious. My personal favorites were the Albemarle Pippin, Esopus Spitzenburg, Roxbury Russet, and Virginia Beauty. What did the rest of the crowd think? We’ll have to wait until the scores are tallied. In the meantime, you can see the results of previous tastings on Monticello’s Saturdays in the Garden Web site.